Myth of White Pearl Woman Sedona, AZ. Today I was hiking in the Thunder Mountain area. 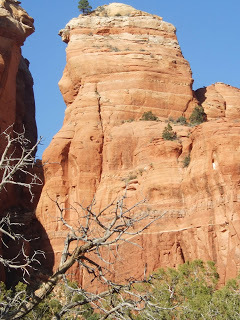 You may remember from my previous blog on the Creation Myth of the Yavapai the story of Kamalapukwia, The Old Woman with a Pearl, or sometimes translated as Old Woman with the White Stone. 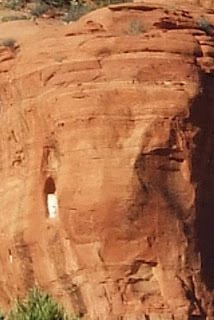 Today I found an image of a woman in the red rock formations. If you look closely at the pictures you will see a profile of a smiling pregnant woman. What I also notice next to this Stone Goddess was a white stone embedded in the same rock formation. 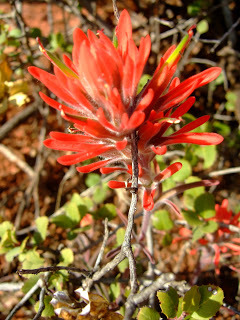 The spring flowers marked the trail and Indian Paintbrush made it appearance adding it’s own beauty to the Living Myth that is hidden in Red Rocks of Sedona.